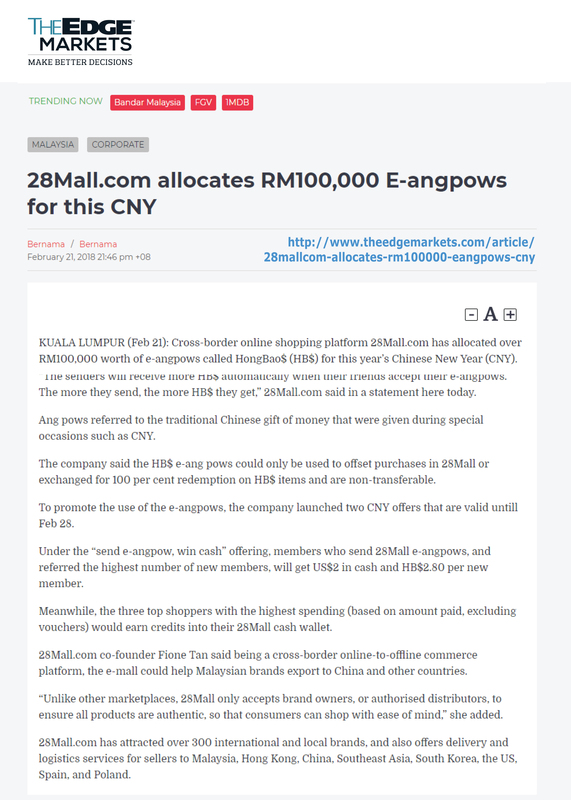 KUALA LUMPUR (Feb 21): Cross-border online shopping platform 28Mall.com has allocated over RM100,000 worth of e-angpows called HongBao$ (HB$) for this year’s Chinese New Year (CNY). 28Mall members can claim e-angpows each day to share with their friends via social media. “The senders will receive more HB$ automatically when their friends accept their e-angpows. The more they send, the more HB$ they get,” 28Mall.com said in a statement here today. Ang pows referred to the traditional Chinese gift of money that were given during special occasions such as CNY. The company said the HB$ e-ang pows could only be used to offset purchases in 28Mall or exchanged for 100 per cent redemption on HB$ items and are non-transferable. To promote the use of the e-angpows, the company launched two CNY offers that are valid untill Feb 28. Under the “send e-angpow, win cash” offering, members who send 28Mall e-angpows, and referred the highest number of new members, will get US$2 in cash and HB$2.80 per new member. Meanwhile, the three top shoppers with the highest spending (based on amount paid, excluding vouchers) would earn credits into their 28Mall cash wallet. 28Mall.com co-founder Fione Tan said being a cross-border online-to-offline commerce platform, the e-mall could help Malaysian brands export to China and other countries. “Unlike other marketplaces, 28Mall only accepts brand owners, or authorised distributors, to ensure all products are authentic, so that consumers can shop with ease of mind,” she added. 28Mall.com has attracted over 300 international and local brands, and also offers delivery and logistics services for sellers to Malaysia, Hong Kong, China, Southeast Asia, South Korea, the US, Spain, and Poland.